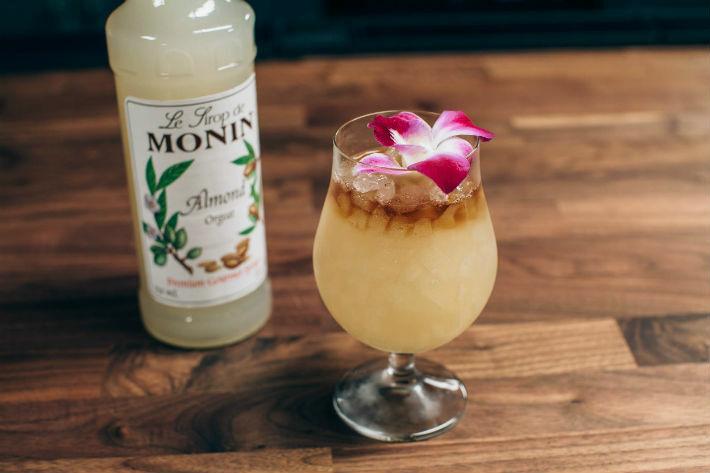 As a premium syrup and concentrate manufacturer, Monin helps people add flavor to their coffee and cocktails. It’s also able to sweeten its email marketing experience by segmenting customers and sending them relevant content. Monin has two target audiences: B2B customers and B2C customers. B2B customers make up about 98% of Monin’s business, according to the brand’s digital marketing director Stasha Johnston. These buyers often work in restaurants, coffee shops, catering companies, or distributors. B2C customers make up the remaining 2% and often consist of young bartenders, working moms, or retirees, she says. Not only does Monin have to address these two different customer groups, but it also has to acknowledge where each customer is in his or her journey. A B2C customer who consumed Monin in a coffee shop, for instance, may want to learn more about the brand overall while a B2B customer who routinely buys Monin for his business may want to be notified about the company’s latest products. 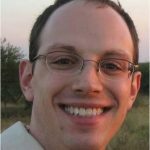 “If you plot [all of these different users] on a graph, they are on so many different points along that journey,” Johnston says. Email marketing helps Monin engage with its customers and guide them through their unique journeys. But a few years ago, it wasn’t getting the email support that it needed. Johnston says that the company worked with an email partner that couldn’t keep pace with Monin’s growth and wasn’t very helpful when issues did arise. “We needed someone who was more involved with us, growing with us, and understood our business a little bit better,” she says. So, in 2015, Monin implemented email marketing platform dotmailer. Johnston says that she had quantitative and qualitative goals for the partnership. She wanted to improve the brand’s email performance metrics (like click-through rates and ROI), but she also wanted to better segment its customers to enhance their progression through their buyer journeys. Although Johnston describes the implementation process as “bumpy” and says it took two to three months for things to be “smooth sailing,” Monin is now able to automatically send marketing emails to specific audiences. In fact, Johnston says that Monin sends 2.5 million emails a year. While Monin sends the traditional batch-and-blast promotional emails, it also segments subscribers based on a number of data points. It segments by purchase patterns and targets people by how much and how often they buy. It also segments based on customers’ engagement habits, such as by sending lapsed customers special offers. It can even segment based on preference. So if a customer prefers coffee to cocktail products, Monin can send that customer coffee recipes. “There’s just a logic in place to make sure that we’re talking to the right people at the right time,” Johnston says. 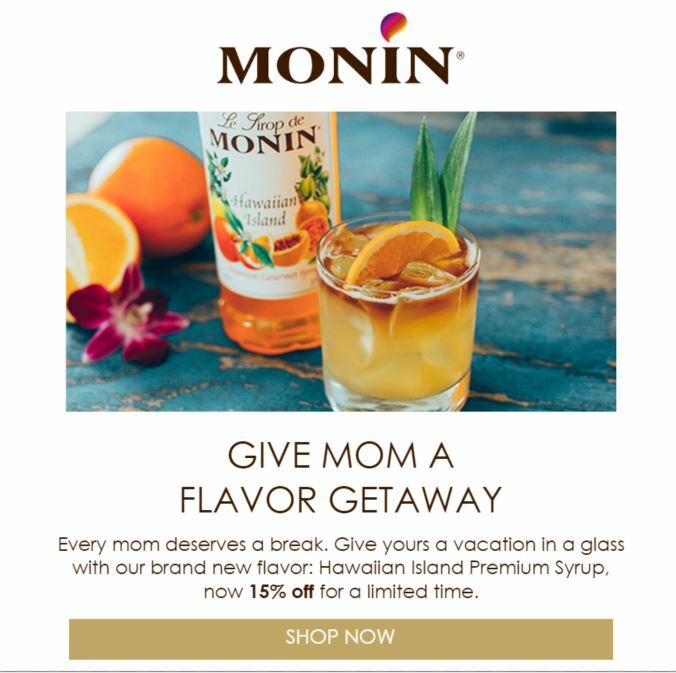 The success of Monin’s email marketing program can be exemplified in the Mother’s Day campaign it ran last year. The brand was debuting its Hawaiian Island Premium Syrup, so it emailed its entire database encouraging them to give their mothers a “flavor getaway.” The email also included a 15% off discount and a “shop now” call-to-action to make it easier for customers to purchase the syrup and give their mothers a “vacation in a glass.” The campaign, which launched in May, drove nearly 40% of the brand’s email revenue in a month alone — a 20% increase compared to the previous year. Monin has also introduced new automated emails since partnering with dotmailer. In 2015, it launched its “Monin Monday” emails to drive sales on what had typically been a sluggish day. The brand started sporadically sending discount codes to subscribers on random Mondays through the year. The first time the company ran this campaign it saw a 400% increase in sales. Johnston says that Monin continues to see boosts in sales “around the same percentage” every time it runs one of these campaigns. Within one year of partnering with dotmailer, Monin produced a 20% increase in conversion rates, a 20% increase in email-driven transactions, and a 10% increase in email-driven revenue. In fact, monthly revenue has increased by as much as 25% after a successful campaign. Johnston says she hopes to get even more granular with Monin’s emails. However, she admits that having to send all of these emails with a small team is no easy feat. As for lessons learned from Monin’s email success, Johnston says it’s important to remember that not every email should contain a “shop now” button. While generating sales is a key goal, she says, marketers also need to focus on qualitative metrics that help them better understand their customers and better earn their loyalty.